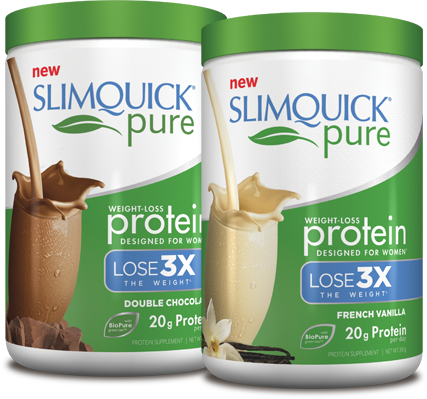 New SLIMQUICK Pure Protein is the only protein supplement designed specifically to help women lose 3 times the weight. Plus, SLIMQUICK Pure Protein tastes incredibly delicious and provides 20 grams of protein and 6 grams of fiber per day! Only SLIMQUICK Pure Protein is make with BioPure Green TeaTM , a natural extract that has been shown in a published clinical study to help overweight women lose 3 times the weight versus dieting alone, in just 13 weeks. For those of you who don't know, I am currently on a weight loss journey. I blog about it bi-weekly, you can see my weigh ins HERE. Prior to taking this, I was doing well on my weight loss journey, and I was really getting into working out. Unfortunately I hurt my foot, and I have had to take it easy for the past few weeks. Right around the time I got the SlimQuick Pure Protein in the mail is when this injury happened. I began taking this daily, and as directed. I will say this has been the ONLY thing that I have added into my weight loss routine recently. No other supplements or diet change. And because of my hurt foot, I had to stop my work outs. So my weight loss journey was down to just eating right and using this. First things first, the flavor of this is amazing! I have the French Vanilla flavor, and it tastes so yummy. It's more like a milk shake than a protein drink. I mix mine with milk simply because I like to keep my calcium up. Inside the container is a scoop which makes measuring the amount very easy. The drink mixes together easily as well. Since I started taking this, about 2 weeks ago, I have lost 3 pounds. This amount might not seem like much, but before taking this, if I didn't exercise during the week, my weight loss was minimal. I am going to be starting my workout routine again soon, and I am going to continue to use this. I can only imagine how well this will work combined with activity. I absolutely love this, and this is something I am recommending to my family and friends. I also will be purchasing this in the future as well! Valid in the USA only. Eating slowly and drinking water make me feel full faster.